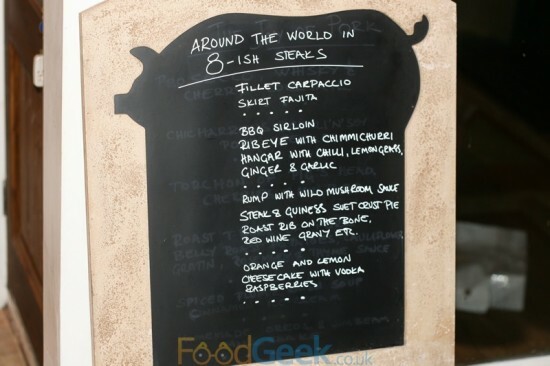 In hindsight, attending a ‘Pit Masterclass’ and preview of new meatastic BBQ joint ‘Red’s True Barbecue‘ wasn’t ideal preparation for a supper club called ‘Around the World in 8ish Steaks’ just a few hours later. But sometimes life presents these unfortunate schedule clashes, where a normal person may have chosen one or the other, I went for option C – eat everything. 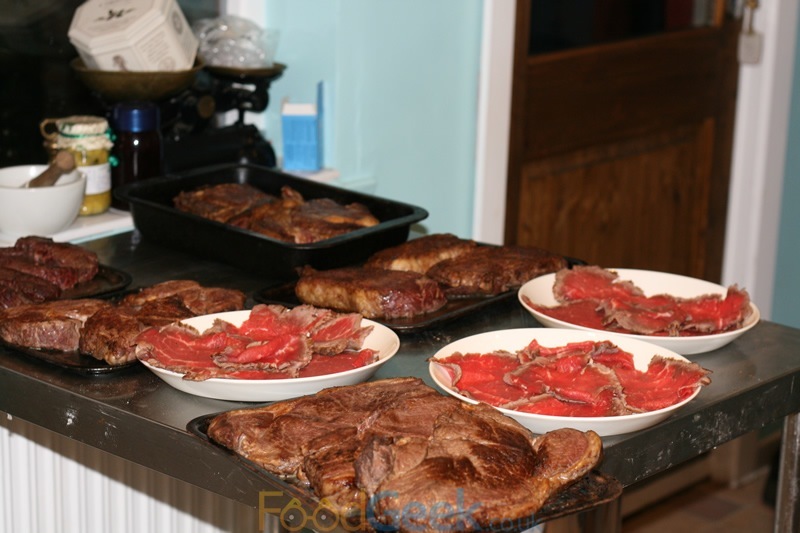 Arriving at Iain’s home in Sale already full of beef jerky, pork crackling and burgers (including the 2,000 calorie Donut Burger) was a little disconcerting, compounded by the sight of his kitchen quite literally piled high with meat. Thankfully it wasn’t time to eat any of it just yet. 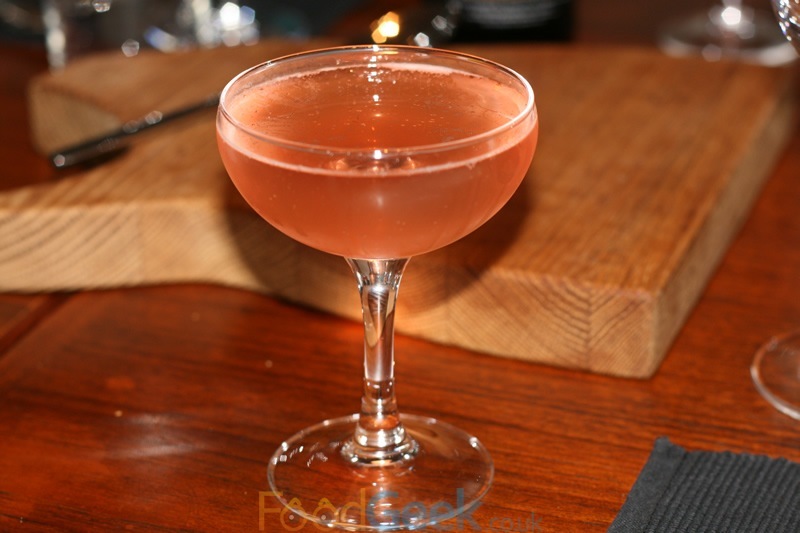 First we enjoyed a refreshing welcome cocktail; home made cherry whiskey with Angostura bitters and prosecco. My second whiskey cocktail in just over 24 hours (following the Maple & Popcorn Old Fashioned at Manchester Foodies awesome American supper club the previous night) and I loved them both, maybe I am really growing up? Whilst enjoying the cocktail I studied the menu and reflected on just how much work is involved in preparing a meal for 12 people involving 8 completely different cuts of steak. Each with different cooking times, styles and accompaniments. The 8 steaks are presented as 8 unique dishes, each inspired by a different country, hence the name. The first two courses were supposedly ‘tasters’, though as i’d suspected were anything but. 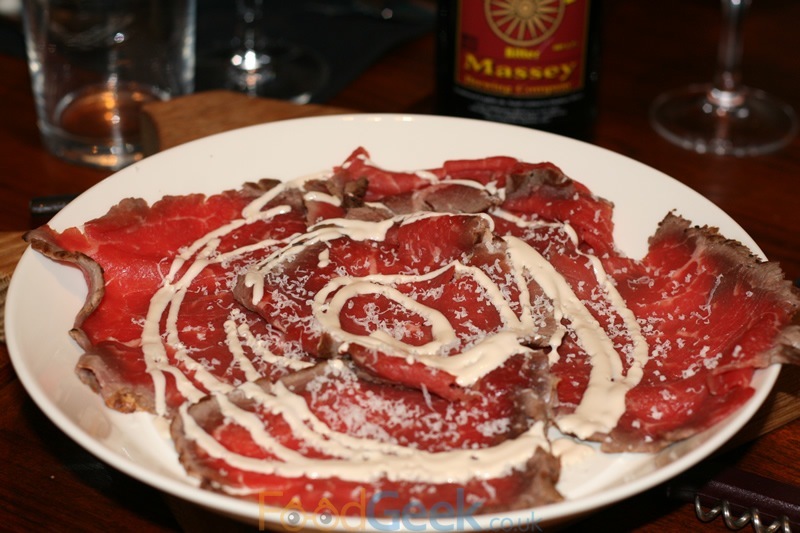 Firstly we visited Italy via a carpaccio of fillet; served mostly raw with just the slightest of sears around the edges the wonderfully tender, thinly sliced beef was the very definition of ‘melt in your mouth’. Topped with a little parmesan and a delicate horseradish cream it was a delicious start which didn’t challenge me too much, so far so good. Shortly afterwards we were on our way to Mexico by way of sizzling skirt steak fajitas. 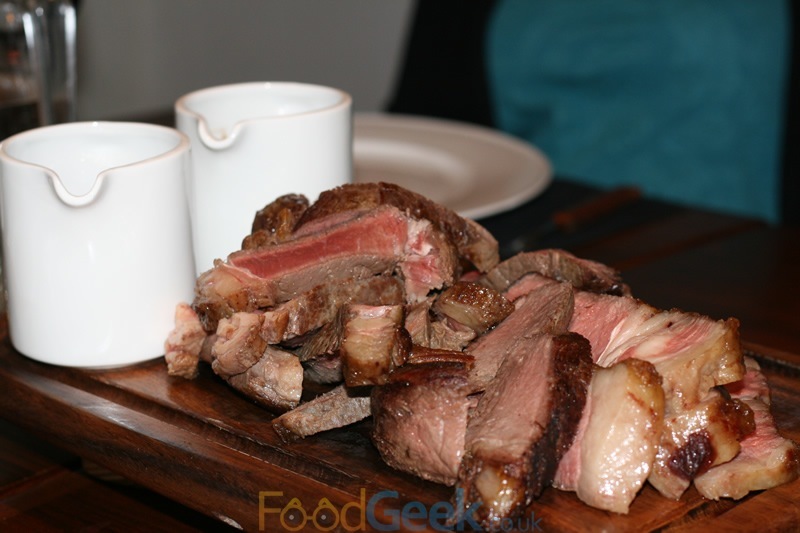 Being one of my favourite cuts of steak I know it can be tricky to cook but Iain absolutely nailed it. 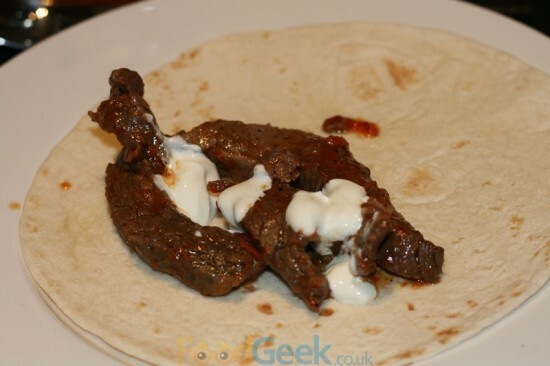 The steaming meat was dressed in a rich red onion & pepper sauce which when wrapped in the soft tortilla with a good dollop of sour cream made for a seriously tasty snack. Of course it was supposed to be all about the meat and knowing how much work was already involved I feel bad for even suggesting that Iain do any more. But I did feel the fajitas would’ve benefited from some fried onions/peppers or perhaps even just a handful of leaves, just to add a bit of freshness. Not that it stopped me devouring several of them though. Following a short break after our ‘tasters’ we were presented with our ‘starter’. 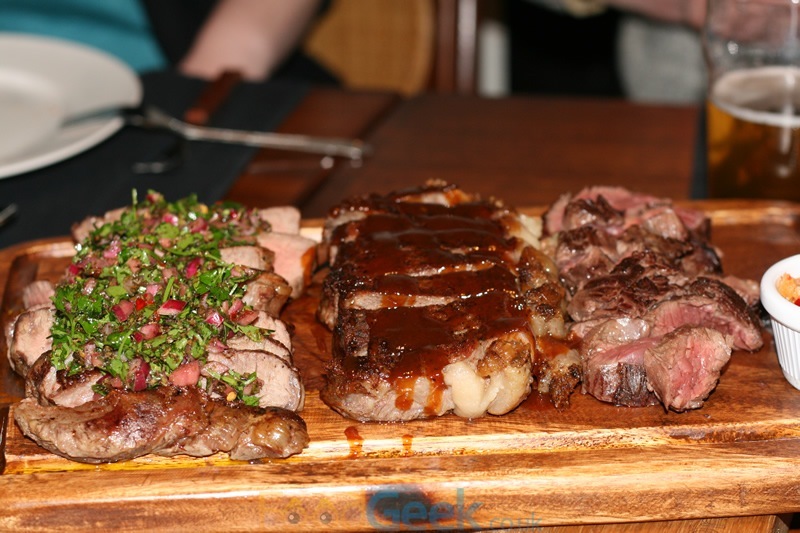 A wooden board loaded with three different steaks, each with a different accompaniment, all equally juicy. They were all perfectly cooked and tasted every bit as good as they looked. The sirloin drizzled with an American inspired smokey BBQ sauce and stunning ribeye topped with famous South American sauce chimmichurri were both excellent. 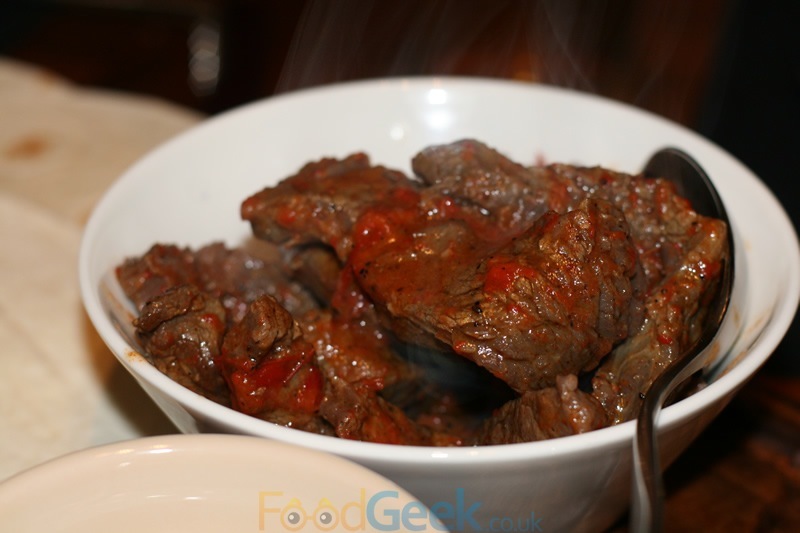 My favourite though was the Thai style steak, partly because Hanger has been my favourite cut since long before it was cool, but mainly because it was served with a little pot of some of my favourite things; chilli, lemongrass, ginger & garlic. 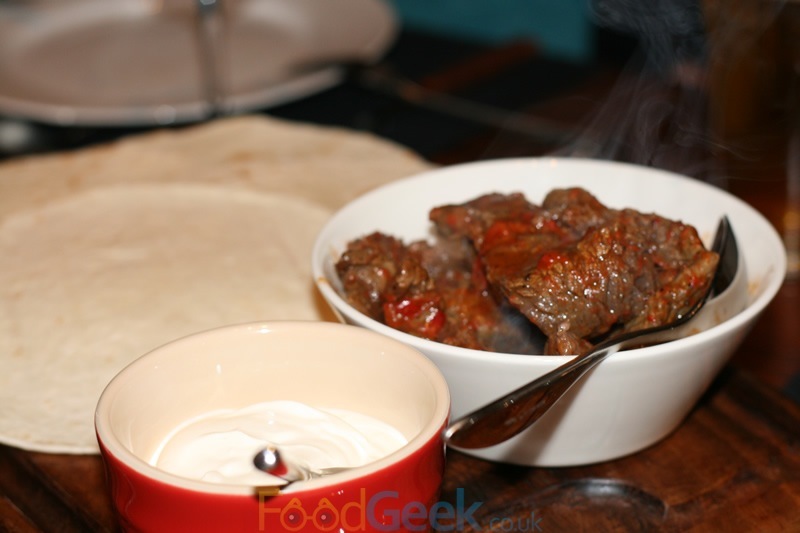 When spooned on top of the hot meat it sizzled slightly, gave off a wonderful aroma and tasted fantastic. I’m not going to lie, I was really starting to feel uncomfortable by this point. It was as if Iain read my mind as instead of more meat, the next time he appeared was with a cool and refreshing palate cleanser. 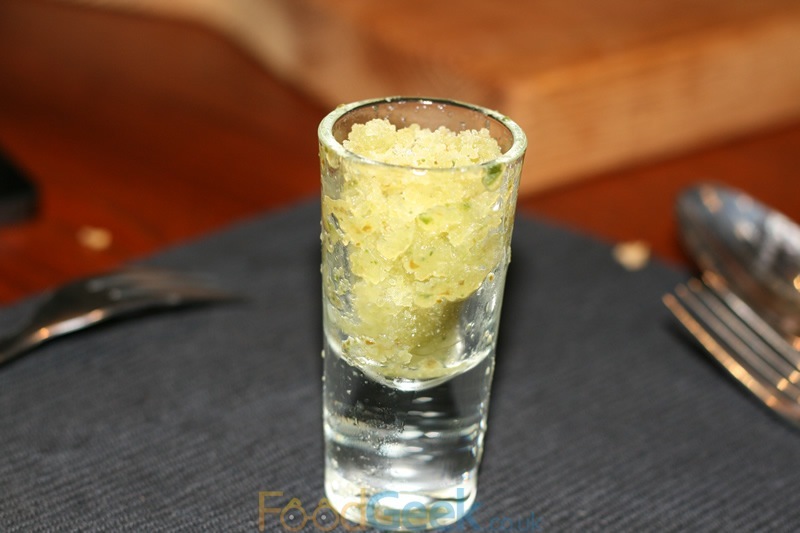 I’d had ‘Gin & Cucumber Granita’ at Iain’s ‘On The Game‘ supper club, the gin had been toned down in this version but it was just as enjoyable and exactly what I needed (well, other than a long lie down). The first of the main courses was French rump steak with a rich, creamy wild mushroom sauce and an English rib of beef, roasted on the bone, served with a very good red wine reduction. 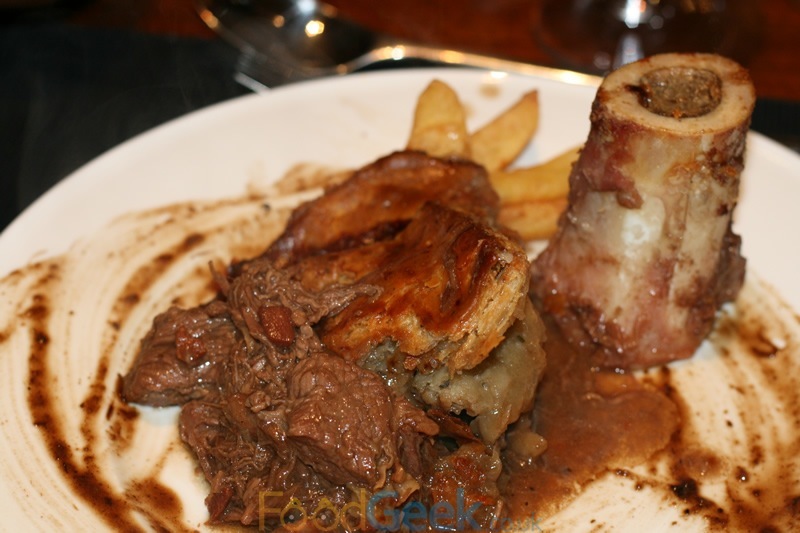 Rib is another favourite of mine so I probably leaned towards that but I couldn’t get enough of the mushroom sauce served with the rump either, it was divine. 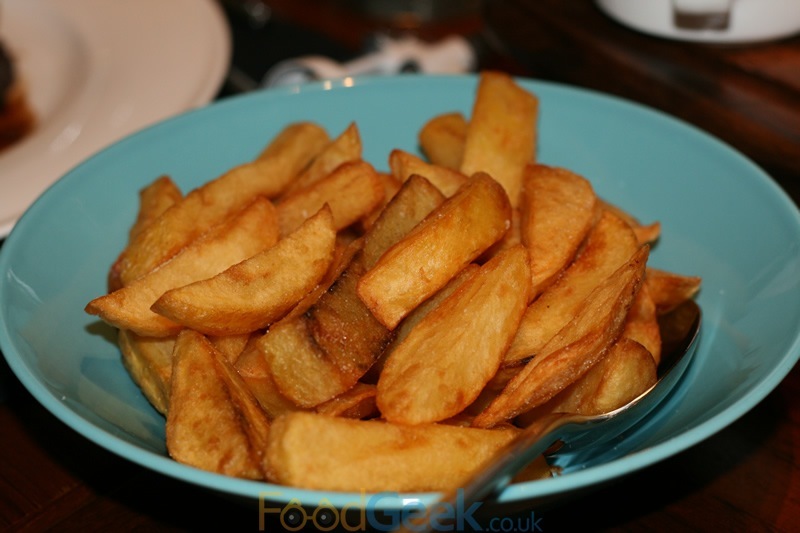 Both sauces were also perfect accompaniments for the crispy on the outside, yet fluffy inside ‘Triple Cooked Chips’ too. Whilst still attempting to finish off the generous portions of rump & rib our final main course arrived. The uncooked pie i’d seen earlier had been transformed into a thing of pure beauty. 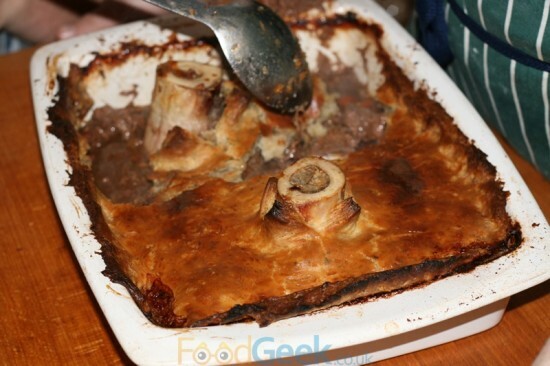 The crust now golden, bones browed with hot bubbling bone marrow escaping from the top. As people were served, amazing beefy aromas filled the room and the rich meaty filling underneath was revealed. Naturally I accepted the offer of a bone and proceeded to dunk my chips into it to soak up all of the heart attack inducing but oh so lovely bone marrow. The pie was immense, I quickly forgot all about everything i’d eaten in the last few hours and devoured every single mouthful. 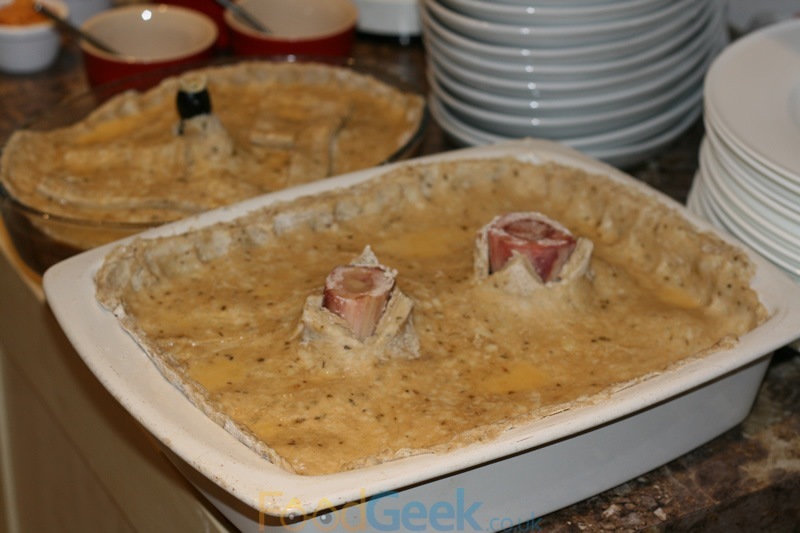 The hot suet crust that i’d also loved on Iain’s ‘Game Pie’ last time is quite simply the best pie topping i’ve ever encountered. He swears it’s simple to make but i’m not sure I can believe him as it’s just too good, if it’s so simple, why doesn’t everybody do it like this? It wasn’t all about the crust though, the filling was also pretty special. Described as ‘Steak & Guinness Pie’ I believe it’s actually made with Murphy’s rather than Guinness as it’s less bitter when cooked. There was certainly no sign of bitterness here, it was sweet, thick and meaty with the soft steak almost falling apart into the sauce. 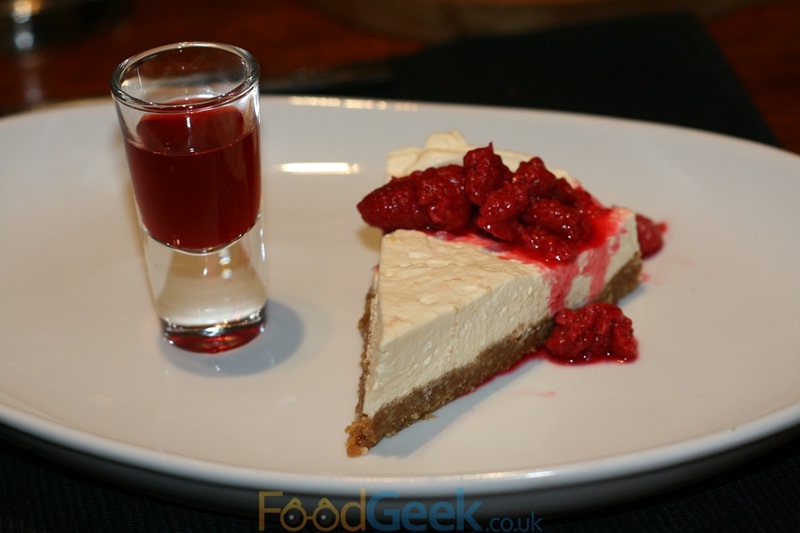 I’d made it this far but there was still one last obstacle in my way, a rather inviting looking ‘Raspberry Cheesecake’. I know Iain makes a mean cheesecake and this was no exception, he gets the ratio of base to cheese perfect and the sharp vodka soaked raspberries were a brilliant topping to cut through the sweetness. It was so good I polished it off in seconds as if i’d not eaten all day. Served with a shot of raspberry vodka too. I’m not usually one for shots, particularly of vodka but I really liked this. I had high expectations after my previous supper club here and having got to know Iain quite well over the past six months i’ve eaten more of his food and never been disappointed. But even after irresponsibly turning up already full the night still somehow far exceeded my expectations. 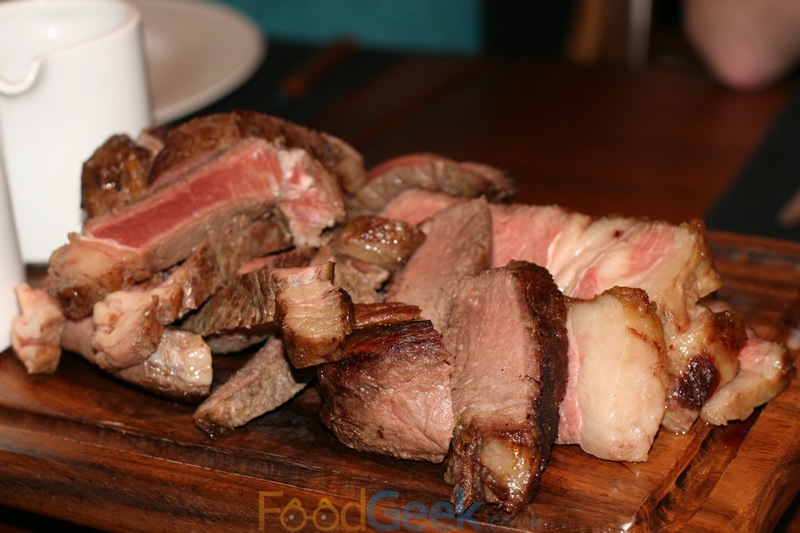 The quality of meat and standard of cooking was phenomenal. I can honestly say I’d have been more than happy to receive any of those dishes in any decent restaurant and would’ve paid almost as much for one course as we paid for the entire night, it’s ridiculously good value. I’m full of respect and admiration for how much work Iain puts into a night like this for presumably little financial gain after expenses. He clearly does it because he loves food, his passion is obvious and quite infectious, more importantly he loves to share his passion and make people happy. I can confirm that he had a room full of very happy people on this occasion.